I’m still not sure of the reasoning for the tweeter’s ridiculing comment. Were they offended by or did they disagree with the content of the article I shared? It was a long article, at almost 3000 words. With what aspects of the article did they disagree? Did they read the article at all or did they just react to my teaser of its content? While they seemed to question my intelligence—with the #stupid hashtag, the triple question mark next to ‘Where do some people get their PhDs?? ?’, and the suggestion that something about my tweet or my doctorate was laughable—the way in which they engaged with me did little to encourage debate or discussion, or to further either my or their understanding. Perhaps their intention was not to engage in dialogue, communicate their perspective to me, or interrogate my perspective. This and some of the Twitter discussion that followed, got me thinking about the nature of some debates on edu Twitter, and of the social media tribalism Greg Thompson wrote about on his blog this week. I’ve written before about the importance of graceful disagreement, such as in this post and in this one. I always learn from listening to the perspectives of those with alternate perspectives and counter arguments. On social media I (mostly) enjoy engaging in debates that help me to understand other viewpoints, see my own perspective from others’ points of view, and on occasion change my mind. If there is one thing my PhD taught me, it’s that there is much I don’t know or deeply understand, and that I have much to learn from others. In my leadership roles I look for ways to get honest feedback from all stakeholders, including and especially those who question, critique and resist. These are important voices to which we should listen. But perhaps there are those who disagree, criticise or mock without the desire to talk further or understand more. In anticipation of more enthusiastic debate and derision over the holiday period in the world of education Twitter, I’ve prepared this handy BINGO card for the festive season. It’s an attempt to see the lighter side of what can sometimes get heated as passionate educators fight for ideological corners. I may have thrown ‘Shakespearean insult’ in there as the odd ‘thine face is not worth sunburning’ or ‘thou cream faced loon’ might add interest to some debates. Post script (11th December): I have begun to realise that there are aspects of EduTwitter arguing that I left off this BINGO card, like ‘false dichotomy, ‘Twitter poll’, ‘hyperbole’ and ‘subtweeting about someone’s lack of understanding or expertise’. I’d also like to clarify that my intention is not to judge any of these moves. They are used by people with a variety of profiles who argue on multiple sides of various debates. I think many of these moves transgress the debates themselves and reflect more of what brings education tweeters together, rather than what separates us. It’s also my attempt to reclaim my own experiences and to inject some fun into what can get intense or even nasty. I’ve especially enjoyed a few of the Shakespearean insults that have been thrown around since my post. Shakespeare really knew how to write a scathing and masterful take-down (although many of these would be classified as ad hominen or hyperbole in the context of Twitter debate). I also love that someone made a GIF with my BINGO card. 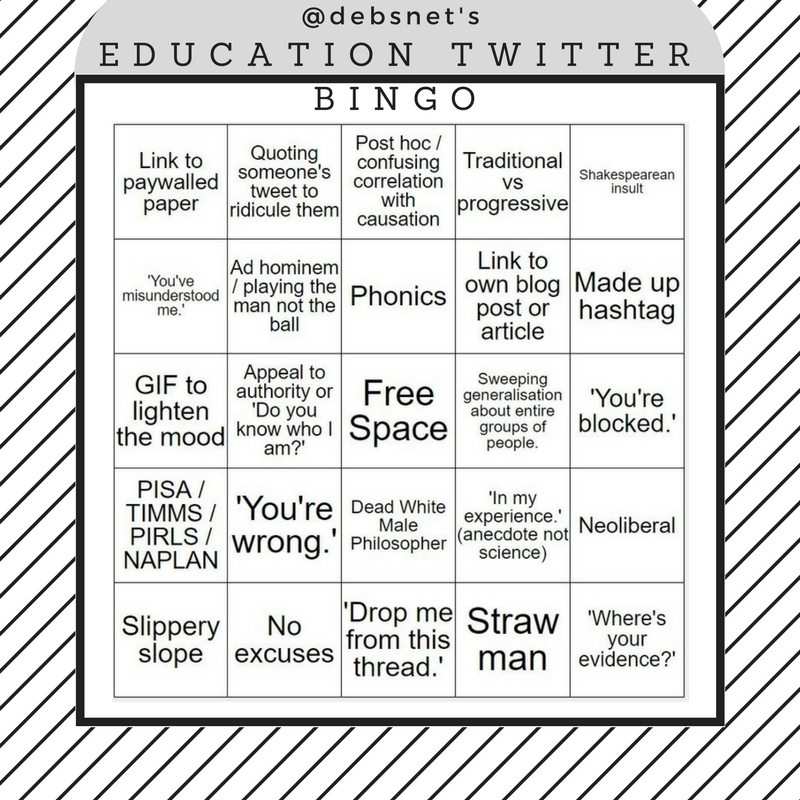 This entry was posted in Education, Social Media and tagged BINGO, Edu Twitter, social media debate, twitter by Dr Deborah M. Netolicky. Bookmark the permalink.